Several ladies from the Sandusky and Erie County Federation of Women’s Clubs participated in the Cleveland Plain Dealer’s “All Nation’s Pageant”, held at Cleveland’s Public Hall. This event was part of the International Exposition presented in Cleveland from November 19 to 28, 1932. While thirty-eight women participated, only sixteen were present for the photograph above. Pictured are: Back Row: Ada Parker, Leona Love, Carrie Beatty, Nettie Beatty, Ms. Drummond, Emma Phillips, Dorothy Drummond, Adeline Rosekelly, Florence Wright. Front Row: Mary Louise Blanckey, Annette Lockwood, Lois Miller, Attie Hawley, Harriet Ruggles, Virginia Caswell, and Marie Harris. 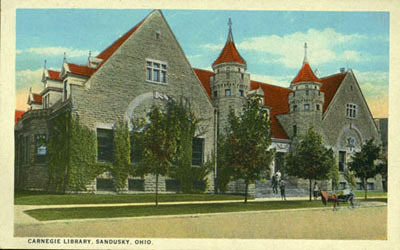 Several scrapbooks, membership lists, secretary’s record book and photographs from both the Erie County and Sandusky Federation of Women’s Clubs are housed in the Sandusky Library Archives Research Center.